A Boston College student finds himself seduced by the luxury of a fellow student's condo in a Chinatown high rise, then realizes that no, that life is not for him. The owner of a Cleveland Circle pizza place that replaced a troubled bar vows the neighborhood won't see a repeat of an Oct. 21 incident in which BPD detectives found the place seriously overcrowded and full of college-age people walking around with drinks in their hands. Read more. 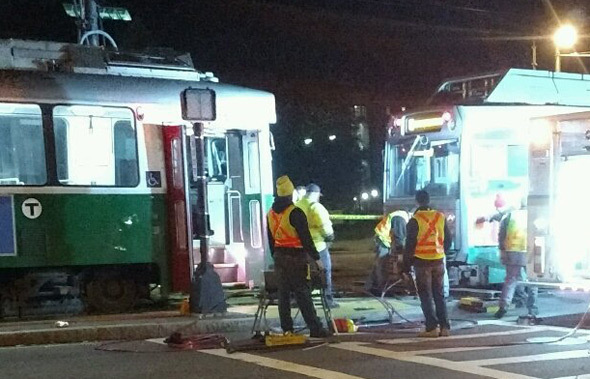 SC had a front-row seat for T workers trying to re-rail a trolley that fell off the rails at Boston College tonight. "Type 8, of course," he writes. Boston College Police report a student returning to her off-campus apartment from Mary Ann's was attacked by one of two men who followed her behind 2000 Commonwealth Ave. around 2:30 a.m. Read more. A North Carolina photographer wants the Gavel to pay him up to $150,000 because, he says, it used one of his photos without permission back in 2013. David Oppenheimer, of Asheville, NC, says the site used this Dylan photo for a since deleted column about various topics, including the singer and Candy Crush. Read more. The BC athletics department posted this video today to prove that Boston College is Boston's college. For some reason, they thought the Charles between MIT and BU would be more of a draw than Mary Ann's. UPDATE, 5:30 p.m. WBZ reports she's been found safe in the woods. State Police report searching the woods behind the Chestnut Hill Mall and Hammond Pond today for Dana Morrissey, a BC senior who failed to attend her graduation today. Read more. Then Boston Police arrive and release him because they didn't have probable cause for arrest, the Heights reports. And they took him to the hospital for the injuries he suffered when tackled. Architect's rendering of new rec center. 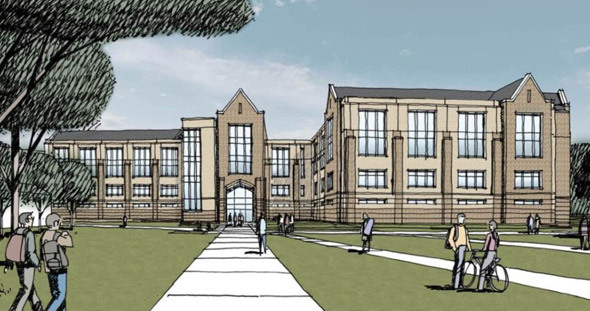 Boston College announced today it hopes to break ground on a 240,000-square-foot recreational center on St. Thomas More Drive this summer, along with new baseball, softball and general intramural sportsball fields on campus. Read more. Water flowing from CVS at Comm. Ave. and St. Paul Street. Photo by Sean Owen. 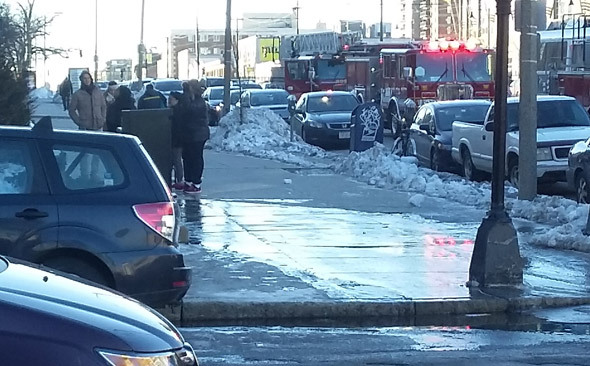 Boston firefighters and ISD inspectors are busy this afternoon responding to buildings where water in pipes froze and burst the pipes, leading to floods of water. Among the buildings affected: Boston College's Conte Forum, right in the middle of a basketball game, where a sprinkler pipe gave way. Firefighters and BC maintenance workers were able to shut the water without requiring any evacuations. Read more. More than 120 BC students have reported to BC Health Services with symptoms consistent with the Norovirus. Nearly all cases are related to students who ate at the Chipotle restaurant in Cleveland Circle during the past weekend. In response to the spread of the virus, BC has taken several steps, including shutting down all on-campus salad bars and other self-service food offerings. The Boston Public Health Commission reported yesterday that several people not affiliated with BC also show symptoms of the illness. City inspectors shut the burrito place in part because a sick employee was allowed to continue on the job. When news broke of an apparent foodborne illness striking down BC students who ate at the Cleveland Circle Chipotle, the chain issued a press release that made it sound like it had closed the outlet voluntarily. "There was an employee that was sick during their shift on Thursday." "Chicken on the service line is 128F and steak is 124F. Provide proper hot holding of 140F or above." Public-health official say that there have been 65 cases so far - some among people not affiliated with BC. UPDATE: Globe reports it probabily isn't E. coli. WCVB reports 28 Boston College students who ate at the Cleveland Circle burrito place now have E. coli infections. A crackdown on underage drinkers in Cleveland Circle has sent the fake-ID crowd outward in Brighton, forcing bars that want no part of them to step up their ID checking. The news came too late for Porter Belly's, on Washington Street in Brighton Center, which found itself before the Boston Licensing Board this morning to explain why police snared two underage drinkers there one night in September - one of whom needed a ride down to District D-14 after he allegedly tried to evade a police detective asking to see his real ID, not the fake license in his wallet. Read more. 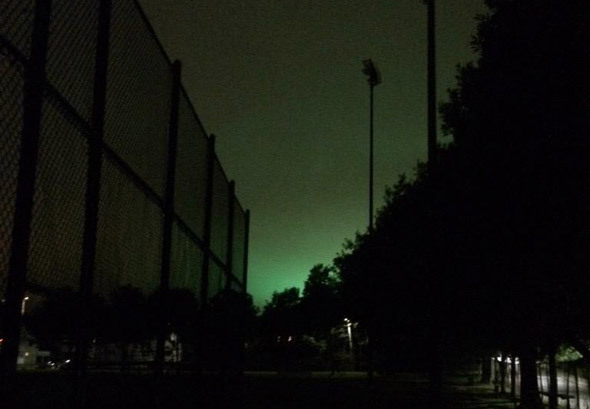 Doug was among the many Brighton residents to notice an eerie green glow in the sky overnight. Rory Razon wondered about that glow: Read more. A combative Boston College senior who smelled of liquor but had the strength that may have come from another substance required several security and police officers to get him into a cruiser at the school's annual commencement ball at the Sheraton Boston on May 15, according to testimony at a Boston Licensing Board hearing this morning. Read more. BC Alert. Missing BC junior Stephen Ziska has returned home safely to his family. Boston College thanks the community and Brookline Police for their assistance. Brookline Police add: Read more. Brookline Police are hoping somebody knows where Stephen Ziska is. Ziska, a biology and computer-science major at Boston College from Brooklyn, was last seen Monday when he left his Brookline apartment. If you've seen him, contact Brookline Police at 617-730-2222. BC Emergency. Bomb threat reported at Lower Campus Dining Hall. BC Police ask all on the Main Campus to avoid area and shelter in place. Update: The college is now asking students to avoid all dining halls on campus. The Boston Licensing Board today ordered Mary Ann's to shut for two days as punishment for a Nov. 14 police inspection that found six underage customers with beers in their possession. At a hearing on Tuesday, Sgt. Det. Robert Mulvey said he and his partner immediately noticed "several small groups of patrons" who appeared to be too young to be quaffing suds legally.